These kind of campaigns give companies an opportunity to change and an excuse why they are changing. One of the things I’ve found is that sometimes people in businesses need examples from others on how to act and how to talk about what they are doing and why. These “opportunity and excuse” steps are important because they help with the goal of positive change and getting people on your side. 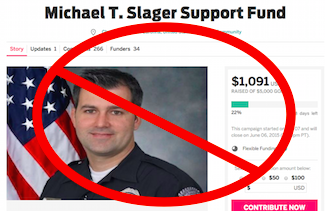 Telling Indiegogo “I’m not going to use your product because you let people create campaigns for Michael Slager.” as in a boycott, throws down the gantlet on your end and throws up the walls on the other. Some boycotts are hard to measure, especially if the people doing the boycotting have never used the product before. It is also quite possible there could be more people who start using the product because they are allowing the campaign to go up and stay up. That is why I try to be clear that the Spocko Method is not a boycott. It educates and alerts people in companies how their product or brand is being used or misused and suggests that the company decide if that is in line with their values, so they can choose. Social media efforts have been used to do some amazing things. It has also been used to harass, threaten and destroy people’s reputations and their lives. When social media is used as a straight forward weapon, it opens the door to misunderstandings and blowback stories. Truly vile people LOVE stories where innocents were victims so they can put themselves in the same category. As many of your know, I’m a big fan of super hero stories and movies. The character Peter Parker had a powerful personal experience that made him understand what happens when he misused his personal power. Uncle Ben explaining that, “With great power comes great responsibility.” isn’t just a motto to Spiderman, it defines him and explains his actions. Tony Stark sees the personal impact of his powerful tools and is challenged to be and do more with them by Professor Ho Yinsen in a cave in Afghanistan. Encouraging, convincing and thanking people for doing the right thing takes time and intelligence. A quick, angry tweet might feel good for 2 seconds, but using social media power in a responsible fashion can lead to a longer good change.